Bella Union are thrilled to introduce ELECTRIC WÜRMS, the new side-project Wayne Coyne and Steven Drozd, whose debut abum Musik, Die Schwer Zu Twerk will be released 18th August. It all began in the 70s when someone invented the right kind of acid that could make you fly! It seemed that everything was, at last, possible. And the overly optimistic freaks of the day began flying into outer space. They flew in spaceships that were, at first, made of futuristic super metal but before too long they didn’t even NEED ships. They BECAME the ships and they called themselves Electric Würms. I think because they became just bolts of electrified electricity that could penetrate wormholes in the far reaches of the unknown heaven. And before they died they sent back to earth beings a sonic bible of discoveries and failures. It was, until now, a strange unsolvable mystery of frequencies and rhythms. Two groups of determined musicians and weirdo thinkers set forth to decipher its message. 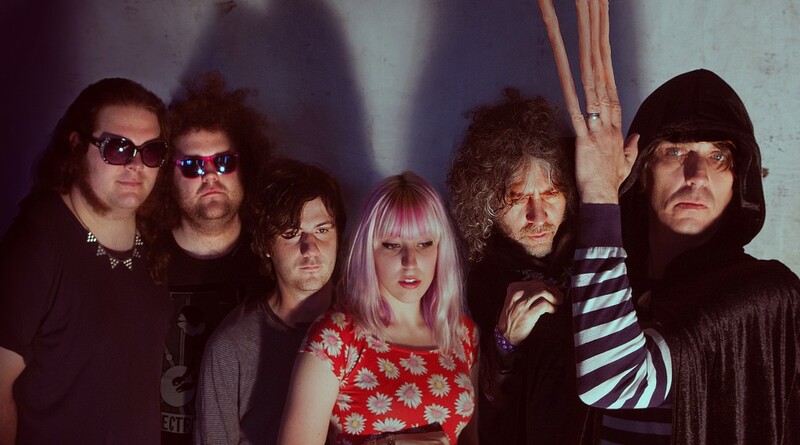 Two members of The Flaming Lips (Steven and Wayne) and four members of Linear Downfall (Charlee, Chance, Doom and Will) were the chosen ones. What you have is the first of what could be endless communicated sound stories. It is titled Musik, Die Schwer Zu Twerk, which predicted this modern day dance move by almost forty years ago. Some of it is indeed hard to twerk to but some of it, if I could do it, is not. There is a particular track called Transform!!! that closely resembles a drug fuelled boogie freak rock track by Miles Davis. Another verse Heart Of The Sunrise sounds vaguely like a song by the prog folk group Yes. Of course Yes also turned themselves into space ships so it’s no wonder these songs share a similar vibe. The ensemble leans toward a hypnotic mood for most of the space bible readings. It is a scary truth that we are hearing and then forced to ponder. The pulsating poem Living states… “live as if you were living already for the second time. And that you had acted wrong the first time”. So they call themselves Electric Würms after the greatest of the super freaks. But they are not a super-group. They are like Sherpas climbing with you. To help you. To love you. All the secrets that they know they tell you. That’s what love is. Musik, Die Schwer Zu Twerk will be released 18th August on Bella Union in the UK/Europe (19th August on Warner Bros in the US).